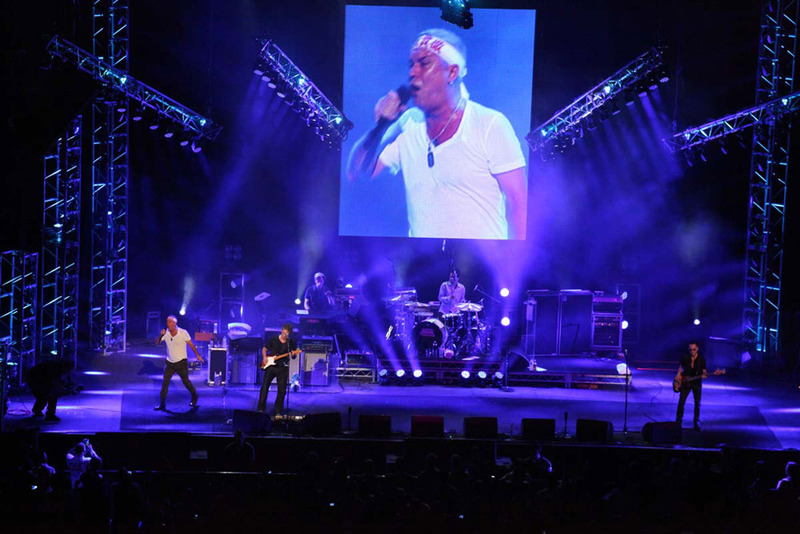 Described by Australian press as "everything a rock show should be," iconic Australian band Cold Chisel’s "Light the Nitro" tour is playing dates across the country with lighting design by Francesco Calvi. Because the tour is playing such a variety of venues - from large scale arenas to smaller amphitheaters, even circus tents - Calvi turned to Martin Professional’s compact MAC 101 wash light as the base fixture in a versatile lighting design. Calvi uses 150 MAC 101s as the foundation of his design with fixtures on eight towers per side for cross lighting and on five finger trusses that move throughout the show, as well as on the floor. Calvi also serves as lighting operator on the tour, directing the show from an M1™, Martin’s popular, full-feature yet easy-to-use lighting desk. Calvi runs eight streams of DMX for the lighting via Artnet and two streams of Artnet for the media server. “We are running over 200 fixtures and it’s been very easy to get around. It is a simple desk to learn and like all things, I am still learning as we go. Other Martin gear used on the show is MAC 2000 Profiles™ and MAC TW1™ tungsten wash lights. Ticket sales for the 10-week "Light the Nitro" tour, the band’s biggest in 30 years, sold out in under a day.